USS Tolovana (AO-64) was a Cimarron-class fleet oiler acquired by the U.S. Navy during World War II. She served her country primarily in the Pacific Ocean Theatre of Operations, and provided petroleum products where needed to combat ships. For performing this dangerous task in combat areas, she was awarded one battle star during World War II, two during the Korean War, and thirteen campaign stars and the Navy Unit Commendation during the Vietnam War. Tolovana was laid down on 5 June 1944 under a Maritime Commission contract (MC hull 730) at Sparrows Point, Maryland, by the Bethlehem Shipbuilding Corporation; launched on 6 January 1945; sponsored by Mrs. Richard M. Bissell, Jr.; acquired by the Navy on 24 February 1945; and commissioned that same day, Lt. Comdr. Carleton G. Long, USNR, in command. 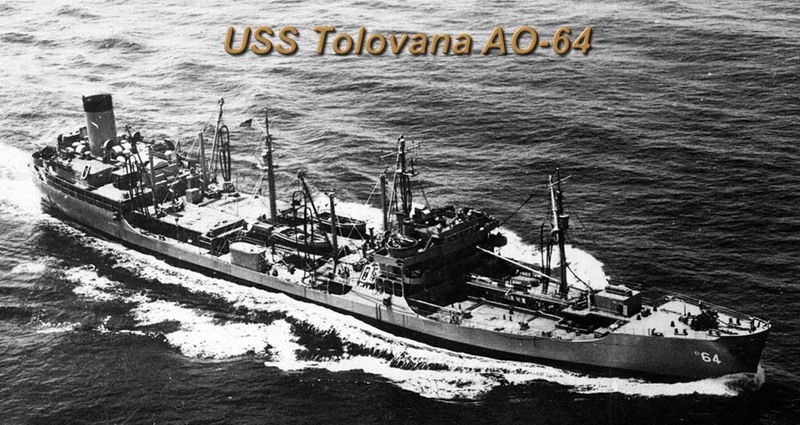 On 15 April 1975, Tolovana was decommissioned, and her name was struck from the Navy List that same day. She was sold for scrapping, 16 October 1975, to Levin Metals Corp. under contract # (MA-8100) for $1.5M.